This Nile Scribes series allows our readers to learn more about Egyptologists from around the world. From questions about their life and their career, we also explore their research interests and their impact and perspectives on the field of Egyptology. We want to use this series to help strengthen the public’s awareness of the Egyptological community, and to illustrate the varied careers and on-going research projects within the discipline. This week we interviewed Dr. Jean Li about her work at el-Hibeh. Who is Dr. Jean Li? Dr. Jean Li received her PhD from the University of California at Berkeley in Near Eastern Studies and joined the department of History at Ryerson University in Toronto, Canada in 2013, where she teaches courses on ancient Egypt, Rome, Greece, and archaeology. 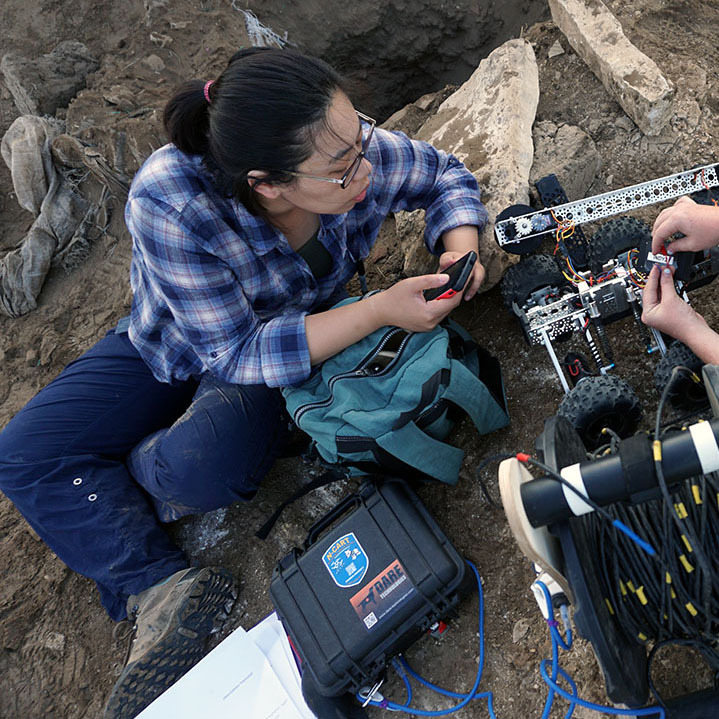 She also works as Associate Director of the Berkeley/Ryerson expedition to el-Hibeh in Middle Egypt, where she is using advances in Virtual Reality and robotics with colleagues from Ryerson to document and preserve the site’s cultural heritage in the digital age. We caught up with her around the Toronto area this month. Nile Scribes: Where are you from and how did you get started in Egyptology? Jean Li: I was born in Taiwan and grew up in the GTA [NS: Greater Toronto Area]. My undergraduate degree was in Near Eastern Studies and Psychology at the University of Toronto and my Phd is in Egyptian Art and Archaeology from the University of California, Berkeley. I had many opportunities at Berkeley, ranging from field experience at el-Hibeh, and working as a researcher at the Center for the Tebtunis Papyri, to working as a consultant for the educational department of the Fine Arts Museums of San Francisco. NS: Egyptology has changed a lot over the last century. In your eyes, where do you see the field going? JL: In my perspective, with the current intellectual and economic environment in academia, there is increasingly a demand for scholars and emerging scholars to both specialize and generalize. I’m not sure that we have the luxury to just be “Egyptologists” anymore. There are the very real issues of a lack of jobs at universities or colleges, and when there are opportunities, most of the time the institutions are looking for people who can do it all—be a scholar of Egypt, Greece, Rome and the Near East. Additionally, in order to be self-sustaining, those in the field, which we are already seeing, will need to increasing adopt, use and engage with new methodologies and technologies. It may be that we will see a couple of possible trajectories—one that trends towards broadening approaches and interdisciplinarity, and the other that is an intensification of specialization. NS: What fascinates you the most about ancient Egypt? JL: I can’t isolate any specific thing. For me, it’s about the interconnected aspects of the culture and how they all work together to produce that distinct and dynamic entity. NS: Where have you worked in Egypt? JL: I work at the site of el-Hibeh, Egypt where I am an associate director. This summer was a great season in which we deployed a robotic vehicle to explore looted contexts. I found out I’m not claustrophobic as I crawled through narrow tunnels as long as 27 meters. It’s amazing how dirty one can get. NS: You focussed your doctoral research on exploring the identities of elite women in Third Intermediate Period Thebes, a work which you recently published. What motivated you to look into this subject area? JL: I’m fascinated by people and the mechanisms and structures that underlie culture and, in turn, group and individual identity. My personal experiences of learning to navigate a new culture, the spoken and unspoken rules that govern success, really impact my research and interests. So much of cultural production is embedded in the material culture, and what Egyptologists have in abundance is material culture. I see ancient Egyptians as a fitting case study to investigate the issues of cultural production, identity and the engagements of people with their material world. And, for me, I see periods of political and cultural fissures as useful lenses with which to deconstruct and examine the processes and structure that produces culture. The Third Intermediate Period is one such case. So many political and “ethnic” groups were involved, all operating within this long-standing cultural milieu and at the same time trying to legitimize their claims and formulating and expressing their own particular understanding of what it meant to be Egyptian. When I started the project, I intended to look at the entirety of the Third Intermediate burial practices in the Theban Necropolis. As I compiled my data, what stood out was the prominence of the elite female material. This started me thinking about the general ways in which ancient Egyptian women were still discussed, and how when we find evidence of women with their own tombs or stelae it is seen as exceptional. Were these practices truly exceptional? NS: You’re collaborating with Ryerson University on a couple of initiatives at El-Hibeh. Can you tell our readers about these projects? JL: I am collaborating with my colleagues here at Ryerson to explore the uses of technology in archaeology. We have a few projects that currently use Hibeh as a testing ground. One is a Virtual Reality reconstruction of the Small Temple to Amun at Hibeh [NS: built by Sheshonq I] and the other is the design and deployment of robots, or as my techie colleagues like to say, UGV (unmanned ground vehicles), to explore and assess the safety of looted conditions at Hibeh. We live in a digital world. There is no getting around that. In fact, one of the major developments in archaeology is the field of Digital Archaeology. Digital Archaeology, at its core, entails the use of computerized tools for recording, analyzing, interpreting, and disseminating knowledge about material culture. In that sense, it doesn’t seem particular innovative and rather intuitive. In fact, it’s been argued that we are all digital archaeologists. As researchers and scholars who are interested in accessing the ancient mind, I think it is necessary to use all the tools at our disposal to help us analyze and interpret the evidence. As technologies develop, we can experiment with using these new methods to produce new or interesting ways of building pictures, figuratively (in every sense of that word), of the past to assist in our understanding. Peter der Manuelian has his Digital Giza classroom at Harvard. Kris Howald, a graduate in the Master in Digital Media Program at Ryerson and faculty member at Sheridan College, is our artist and creator [NS: Check out his incredible ongoing work on the project’s blog]. He did a great job with this initial iteration. And we would like to continue to refine it. NS: Can you tell us some of the implications of using Virtual Reality within archaeology? JL: The issues with VR are numerous. What are we trying to do with this representation? Is this the next logical step in phenomenological approaches to the past? Are we trying to create an environment in which the person interacting with it would believe that they are in that context, like (and I’ll date myself here) the Holodeck in the Star Trek series? To what benefit or value? And the technology is not at that level. Right now, even the best virtual representations do not look “real.” This causes cognitive dissonance. But do we want to aim for “real?” If that’s the case, one could ask, are we just producing pretty pictures of the past? Again, to what purpose? How do these images help with production of knowledge? There is also the issue of money and accessibility. An immediate benefit I see is that I can use this in the classroom. This semester I plan on having my senior students in my Archaeology and Material Culture class experience the VR walkthrough, and this will be in conjunction with our discussion on the future directions of archaeology. The Nile Scribes are grateful for Dr. Li’s participation in this series. If you have any questions for Dr. Li, you may contact her online through her profile below or leave a comment on the blog. Photos are courtesy of Dr. Li and the El Hibeh Project. Have you read our first instalment of ‘Meet and Egyptologist’ with Manchester Museum’s Dr. Campbell Price? Readers – who would you like us to interview for this blog series? Leave your suggestions in the comments! This a great interview, and Dr. Li’s work is fascinating! I’m interested to know more about the robots/UGVs that were sent down looter tunnels. Did they design the UGVs from scratch or use existing models? What are the biggest challenges for that project? And, most importantly, does the idea work like they hoped? Dr. Li has told us that she’ll be presenting her results at this year’s Annual Meeting of the SSEA in November.